Walk #32 Fern Dell and Immaculate Heart. I had a minor panic attack when we arrived at Fern Dell…. “Where did the treat bag go?” We searched the car, under the seats, around the back, couldn’t find it. I was so sure that I had brought the treats. I was pleasantly surprised. 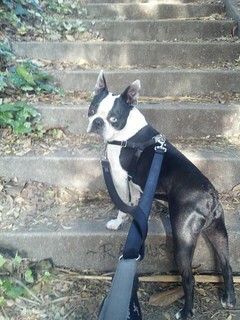 Boogie proved me wrong and was a well-behaved little walking buddy. He looked like he was having the best time ever, even though he couldn’t care less about the views of Downtown LA, The Griffith Park Observatory, a house designed by Frank Lloyd Wright’s son and some castle that Nicholas Cage used to live in. Boogie was trotting along with his tongue waggin’ in the afternoon heat, sniffin’ lots of stuff, peein’ on lots of stuff, climbing stairs, climbing hills, looking at squirrels and chipmunks…and then the joy of our breezy car ride home. 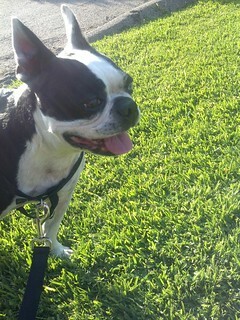 As usual, Boogie doesn’t seem to tire after long hikes. When we arrived back home, he brought me his ball…. 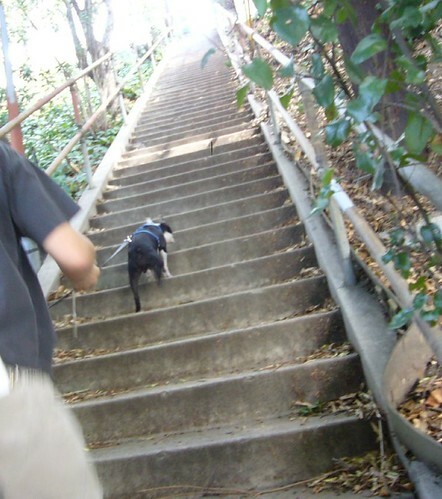 Monday: Our next staircase hike with Sarah! It was my birthday last week and Sarah, our trainer gave me this PATTERN GAMES DVD by Leslie McDevitt. Thank you, Sarah! Sarah understands how complicated Boogie is and how much he needs to “feel in control”. Here’s a YouTube video explaining what the DVD is about, with doggie footage. I look forward to watching this DVD, doing the games with Boogie and of course, I will blog about our experiences! I think Boogie’s main problem is that not only is he triggered by certain types of people, he doesn’t do well with Sudden Environmental Changes. I have read that S.E.C is actually quite common. Due to lack of socialization as puppies, dogs can grow up to be easily spooked or startled. I have been doing major classical counter-conditioning with Boogie for the past 3 weeks following an ‘upsetting incident’ on which I would rather not elaborate. Every time we see a person on the street, no matter how near or far, how big or small, old or young, carrying bags or not carrying bags, walking slow or walking fast, I have been giving Boogie treats. As soon as Boogie registers the presence of the person, I ask for eye-contact, we move to the side and he gets a treat. The closer or larger/scarier the person, the more treats he gets. Sometimes, if Boogie remains under-threshold, we continue walking and I give Boogie a treat right after the person has just passed us. Instinct tells me this is important because Boogie used to lunge at people from behind. It is behavior “blind”-we don’t care what Austin [dog] does, all we care about is that once men are on the scene, good things happen to Austin. It is a powerful conditioning technique but difficult for people to get their heads around. The behavior-blind part flies in the face of what is an extremely operant conditioning-oriented training culture. It’s a piece of cake to fulfill the men=cheese contract when Austin just looks at the guy, but much harder psychologically to provide the cheese if Austin goes off at the guy. It feels to the trainer like she is “rewarding” the behavior. 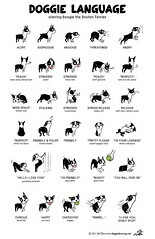 When Pavlovian counter-conditioning is used in conjunction with desensitization, this issue is mostly avoided because the desensitization part (by definition) prevents the dog misbehaving (unless you screw up). But in a straight-up counter-conditioning procedure (i.e., one performed without desensitization), you will often find yourself supplying the fabulous thing right after the dog is naughty. To do otherwise would be to weaken the connection between men and goat cheese. There are no effective “schedules” in classical conditioning, just extinction trials, which are bad for the cause. The closer you can approximate a 1:1 ratio of men to goat cheese, the stronger the conditioning. In a sense, we are going back to BAT Stage 1 (or Look At That) with human triggers but sometimes I deliver the treat even before we walk away because I want to strongly associate the sudden appearance of people with good things. 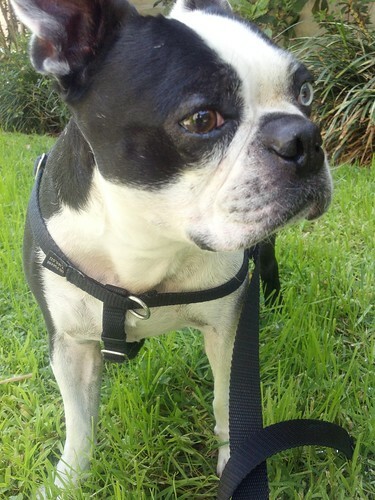 In life, surprises happen all the time… I want to help Boogie not be so easily spooked. Sometimes, there is also no room or time to move away. Here’s another activity for the Summer. 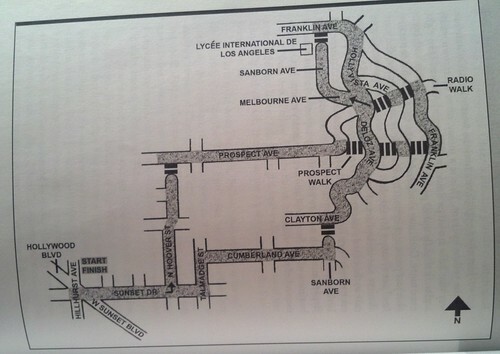 I recently got a copy of Secret Stairs: Walking Guide to the Historic Staircases of Los Angeles. 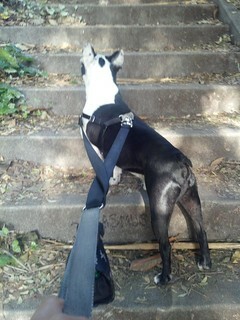 Yep, Boogie and I will be staircase-hunting on long hikes around the neighborhood! 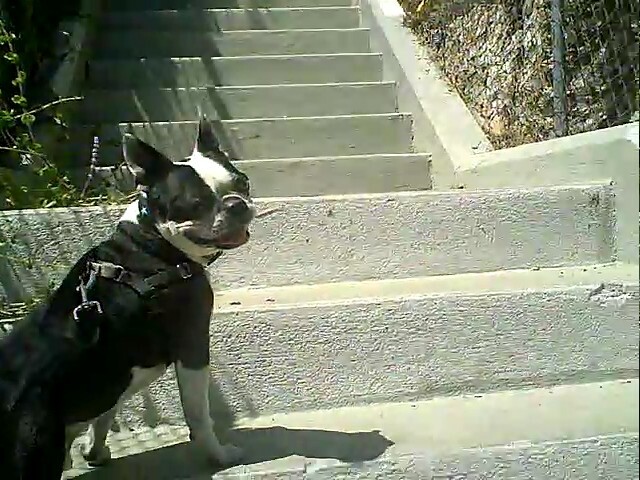 Boogie has a thing about climbing stairs and is definitely way more fit than I am . Oliver & his brother Piccolo, live across the street. We see these doggies everyday on our walks, and Boogie was invited to Oliver’s birthday party this past Sunday. I hadn’t planned on bringing Boogie to the party. 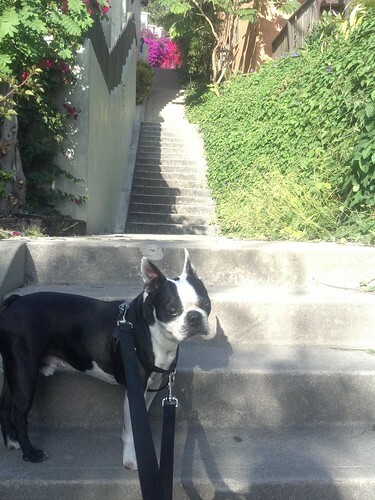 I was told that there would be 10-20 OFFLEASH dogs – most of whom would be unfamiliar to Boogie – running around a tiny courtyard. There was no way I would feel comfortable in this situation, nor would Boogie. 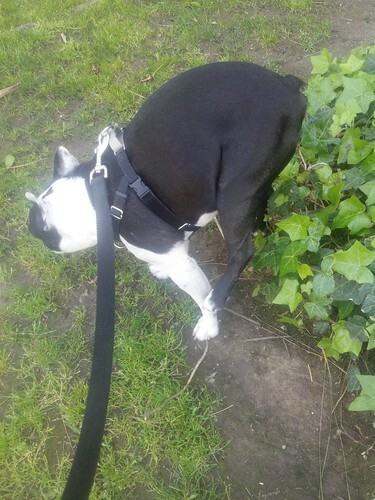 Besides, it wouldn’t be fair to keep Boogie on-leash in a sea of off-leash dogs and there is no way I would let Boogie off-leash in an unfenced area. We arrived late in the afternoon, at the end of the party when all the big dogs had gone home. There were a few small friendly dogs remaining. Boogie was very calm, relaxed and sweet. Everyone commented on how “good” he was. The big slice of organic carrot-oats-honey-peanut-butter birthday cake helped, I’m sure. 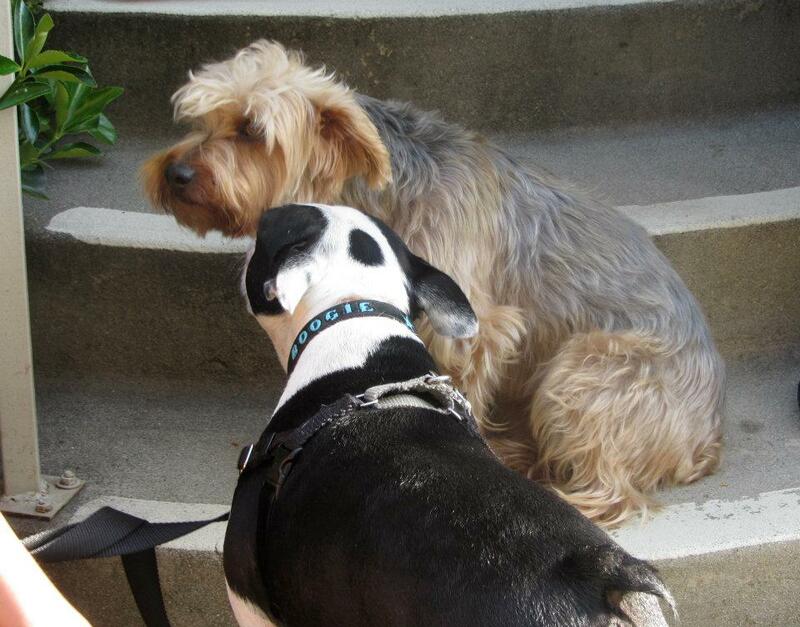 *Body language observation: When Boogie greets an unfamiliar dog, his ears are up and his neck is stiff. When he greets a buddy, his ears go back. Here he is with frosting on his nose. If it is a person that Boogie knows, his ears go back, he jumps up, offers kisses, gets pets, moves away. 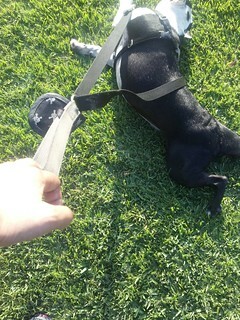 If it is a person that Boogie doesn’t know, he stops moving. Goes really still by my side, and stares. This nervousness is often complicated further by what the person does next, which is to stare back at him (“Hi Boogie!”) or reach out their hand or take a step forward to pet him before I say “NO, he is nervous and might bite you”. Not all human beings listen and understand. Perhaps we need a Space Etiquette type poster for human beings, too. We had such a good walk this morning, that I have to share! 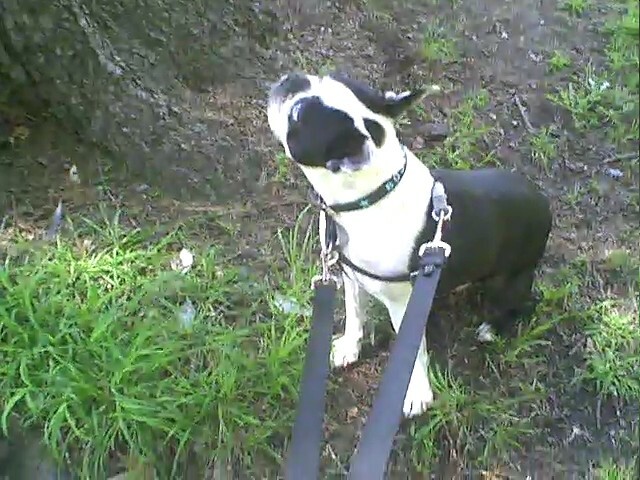 This time, when Boogie saw the unfamiliar human being in his territory, he stiffened, then turned back to look at me, it was more of a “That dude has bacon, I want to move forward” vs. the usual “OK, lead me away back towards the apartment and give me my treat”. I gave Boogie a treat anyway, for turning back to check with me. John asked me if it was OK to give Boogie some bacon. We moved forward, Boogie got a piece of bacon and then he politely plonked his toosh down on the pavement in front of John. No seconds, but hey, what a good start to the morning walk. Me: “Not really. 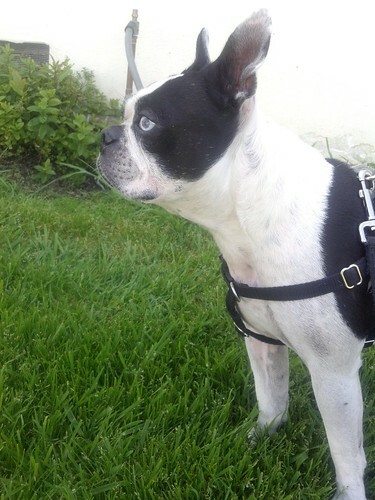 He usually barks at guys in uniform”. Mr. Uniform did not come forward. He stood where he was and next to me, Boogie sat down. Mr. Uniform chatted away throwing more compliments at Boogie then said “OK, OK, I am leaving now. Go with your mom”. I thanked him and said goodbye, and Boogie and I moved on home. It is so nice to meet strangers who want to meet your dog but who are truly dog-friendly and polite!